Color Source PAR LED fixtures were evaluated for the Television Lighting Consistency Index (TLCI) using measured output spectrum and optimized mix solutions for a best spectral match to black body sources at 3200K and 5600K. TLCI provides a measure of the color performance of a light source when used with standard television or video cameras. Such devices have a different response to the human eye so other color metrics such as CRI and CQS are not appropriate. Because of the difference in sensitivity and response of the human eye and video/film sensors there is no direct correlation between the CRI or CQS of a light source and its TLCI value. In general terms, the more complete the spectrum of the light source and the smaller any gaps in that spectrum, then the higher all color metrics will be. However, for discontinuous sources, such as many LED products, it is quite possible to have a good CRI and CQS and a poor TLCI, or vice versa depending on how those gaps and discontinuities align with the response curves of the camera’s sensors. As our experience tells us, what is right for our eyes may not be right for the camera. 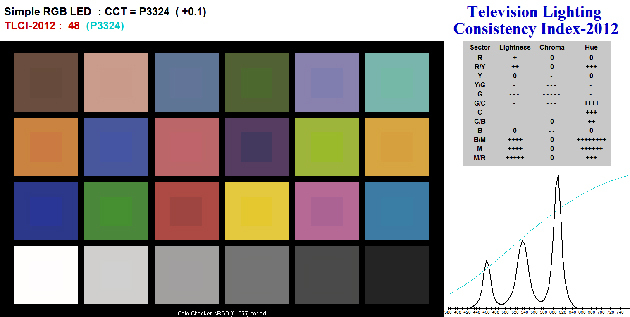 TLCI uses the colors from the standard television/film ColorChecker test chart (sometimes called the Macbeth test chart) instead of the CRI or CQS colors. It then processes the response from those colors when illuminated by the test light source through a modeled standard camera with normal matrices and gamma. This data is compared with that produced by using a black body light source of the same color temperature. Below is an example of the data provided by the calculation, in this case for a generic RGB LED light source. At the top left of the report is the summary. It shows (in black type) the test illuminant, its calculated Correlated Color Temperature (CCT) and the distance from the black body locus (in multiples of 0.0054 in CIE1960uv chromaticity, as recommended in CIE Tech 15.3), this value should preferably be less than 1. Below that (in red type) is the TLCI value and (in cyan type) the reference luminaire used. TLCI ranges from 0 to 100, with 100 being perfect. The expectation is that anything with a TLCI value over 85 will need almost no color correction for use on camera to broadcast standards and may be used immediately. Lights with TLCI values between 50 and 85 should be usable with some color correction, although time may be needed to make the light usable on camera. A value below 50 may not be usable, even with color correction. At the top right is the Colorist’s Advice Report. 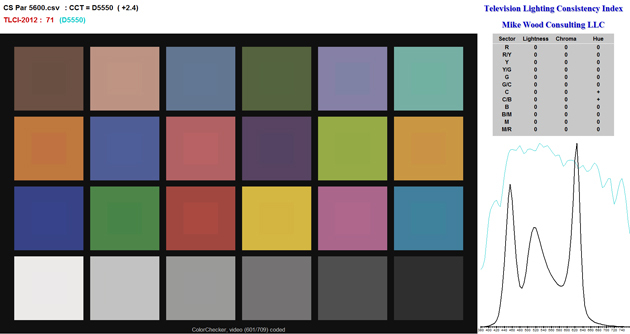 This gives advice for the colorist attempting to correct for the color errors, in 12 hue sectors, with, for each sector, a suggestion for the correction needed in Lightness, Chroma, and Hue. This advice is not, and cannot be, precise or definitive, it is only approximate. A zero value means that the error is probably too small to be visible, a single + or – means the error is very small and the sign tells which way to apply correction), multiple + or - tells that the necessary correction is progressively greater. Bottom left are the standard Color Patches which show the colors of the ColorChecker card. The central portion of each patch represents the test light source, surrounded by the reference. Finally, at the bottom right is a plot of the spectral power distribution of the Test (in black) and Reference (in cyan) illuminants.